Shake to mix. Hypoallergenic. Non greasy. Soap, colour and perfume free. Tested by dermatologists. Daily care, suitable for children who may be prone to dry, sensitive & itchy skin. Mix the two layers to gently cleanse and moisturise the skin.Because skincare should be an enjoyable experience for both parents and children, E45 have developed a range of daily care products that are both fun to use and gentle on dry, itchy and sensitive skin. 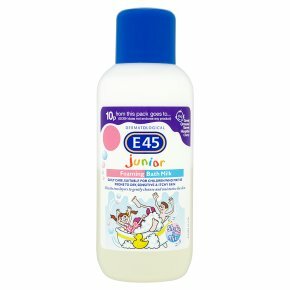 The two layers of E45 Junior Foaming Bath Milk combine the fun of soft and creamy foam with a soothing milk to gently cleanse and moisturise children's skin. How to use: Shake well before use to combine two layers. Pour directly under running water and swish to a foam.